Less than six months after my second hip replacement I can water ski and play tennis, completely pain free. It has been more than 5 years since my hip replacement in June of 2013. When you informed me that my left hip socket was “bone on bone” with no cartilage left, I wasn’t surprised. Being born with a dislocated hip and having been casted as a child, I knew this would be likely. My father had already had both hips replaced by a surgeon in New York City, thus genetics were not in my favor. At 52 years old I still felt too young for this surgery. However, my pain was intense; I wasn’t able to sleep through the night any longer. I was limping and had given up tennis a few months earlier because I could no longer run for balls. My surgery went smoothly. I was up and walking on Day 2 and home on Day 3. My pain was minimal and mainly incisional. After a few home physical therapy visits, I was able to perform the exercises independently. I began swimming after my stitches were removed and gradually returned to my normal exercise routine. Within 6 months I was playing tennis and rejoined my team the following year. There is virtually nothing I cannot do that I did before surgery, and I am completely pain free. 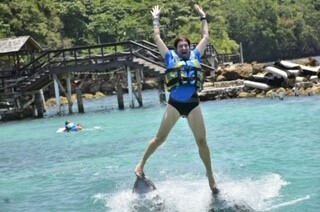 I was even able to balance on a dolphin’s nose this past June in Jamaica, 5 years post op! I am very grateful to you and your wonderful staff for guiding me from beginning to end on this amazing journey. People are amazed I have had a hip replacement because of how well I move around, including chasing 2 granddaughters! Thank you for everything! https://holycrossleonecenter.com/wp-content/uploads/2019/02/Bett-Zipper.jpg 212 320 Diana Hanford https://holycrossleonecenter.com//wp-content/uploads/2017/11/Leone-Center-Logo@2x.png Diana Hanford2019-02-01 09:22:142019-02-01 09:22:42Less than six months after my second hip replacement I can water ski and play tennis, completely pain free.